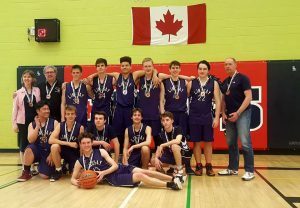 The Lindsay Wildcats U17 Juvenile Boys recently capped off a successful season with a Bronze Medal at the Ontario Cup Championship in Markham. The boys dropped their first game to Whitby Gladiators (64-44), before making their run, posting victories over York South Silver Knights (56-52) and Guelph CYO Knights (61-44). The Bronze Medal game was a thrilling match, with the Wildcats closing out the North Toronto Huskies B squad 60-50 in exciting fashion. Congratulations to Coaches Andrew Flynn, Jake Thalen, and the U17 Juvenile Boys! LET GO WILDCATS!! !